Ok. I am planning on starting with (4) relays. Blue channel 5v pwm dimming on daytime cycle. I have an 8 relay board. But was keeping it as simple as possible for now. I followed your fritz diagram to hook up the pca9685 but I don't know anything about the pins or numbering etc. I didn't see a diagram for the relay board so it's just sitting. Forgive my ignorance on all this. I love electronics and want to learn more. I figured if I dove into it, that would be the best way to learn! Do you have an example for the board section of config. I think I figured out the outlets and pins. They don't show up on the browser yet though. No worries here I am happy with how far I got so far! The browser shows dashboard/electronics/equipment/ etc. I think this is what is confusing me. Sweet! I had to clear browser history for it to work. I'll play with this for a bit. 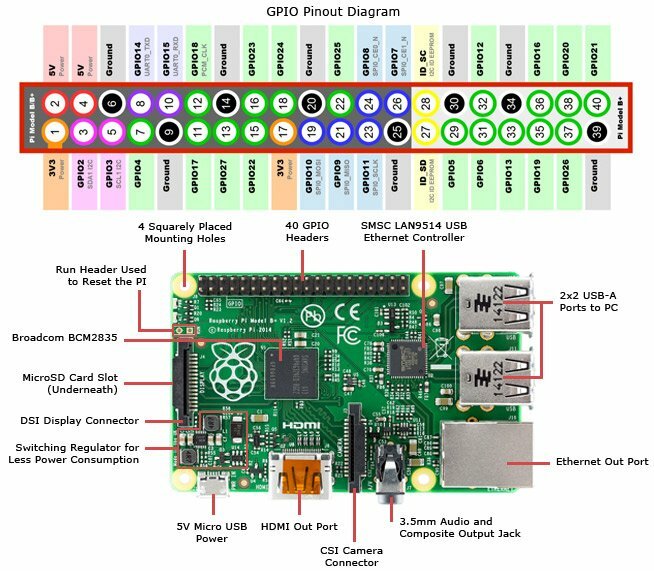 For example pin number 7 (denoted in green circle) is GPIO4, so in configuration file, use 4. For PCA9685 just use contiguous pin number (starting from 0 till 11). Once you declare an output as pwm type in config, the equipment using that output will automatically have a slider, to control the pwm value. For LED lights this will dim it, for DC pumps it will vary the speed (can be used to do nice wave makers). you should be able to combine any equipment and action (on/off, set pwm values) for setting up periodic jobs. Awesome! Thanks again for your time and hard work! I'll get back with you when I get more time to work with it. njtiger aquariums and Ranjib like this. Following along, you guys are doing a great job! Now that my tank is showing signs that it has cycled I am hoping to be able to start developing something to use as a controller (in between coming into the home stretch for our wedding next month). njtiger aquariums and scriptmonkey like this. I have relays working along with 2 channels pwm. After editing the config file, the browser still shows the old equipment from the original, along with my new added equipment labels. Any ideas why the old labels are sticking around? I have certainly learned a lot by the way it is now, it just leads noobs like me to questions. I am gonna keep learning away, however you set it up. I do think the UI adressing is cool though. Ranjib, a few days ago I asked about wiring using the PCA9865 board and a transistor for 0-10V. I see Adafruit's example python code for the breakout on their website ( https://github.com/adafruit/Adafruit_Python_PCA9685/blob/master/examples/simpletest.py ), but I'm wondering if you could possibly share your python code for dimming? If not no big deal, I know some python but could definitely use a head start on this particular library and program! reef-pi is written in go, a different programming language than python. Does that answer your question?